Artificial intelligence will be one of the focus areas at the European Machine Vision Association’s business conference, when it takes place from 7 to 9 June in Dubrovinik, Croatia. Jeremy White, executive editor of Wired, will give a keynote called ‘The rise of artificial intelligence’ at the event. Machine learning has become a big talking point for the machine vision community over the last few years, and a number of machine vision software providers such as MVTec, Matrox Imaging and Adaptive Vision are now including functionality in their software based on neural networks. 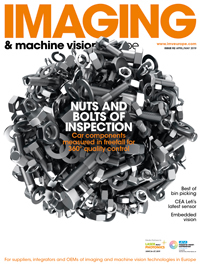 Michal Czadybon, general manager at Adaptive Vision, will give a presentation about deep learning in industrial quality inspection – Czadybon wrote an article on this topic for Imaging and Machine Vision Europe. In addition, Professor of Jitendra Malik from UC Berkeley, currently the Arthur J. Chick Professor in the Department of Electrical Engineering and Computer Sciences, will speak about deep learning for deep visual understanding. Professor Malik's research group has worked on many different topics in computer vision, computational modelling of human vision, computer graphics and the analysis of biological images. He gave a keynote presentation on neural networks at last year’s Embedded Vision Summit in Santa Clara in May 2017. The agenda for the EMVA’s business conference, as well as all registration and other details, can be found at www.business-conference-emva.org.